Art of Acupuncture is a Chinese Medicine and Well-Being Clinic in Fort St, near Wellington Square in Ayr. Dr Guomin Jiang, well known in Ayrshire for Traditional Chinese Medicine and Acupuncture Therapy, graduated from Beijing University of Chinese Medicine in 1993 fully qualified in TCM, Chinese Herbal Remedies, Acupuncture Therapy, Acupuncture Qi Points and Tuina Massage. 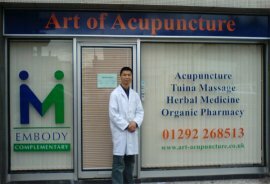 Art of Acupuncture covering Ayr, Troon, Prestwick, Ayrshire.